I would like to acknowledge the many people who contributed to making this exhibit possible. Special thanks go to Chris Bondante, Cindy Hartwell, and Joyce Peters who spent hours working on every aspect of preparing and presenting this exhibit; to James Thomas for his artful framing; to George Montgomery for assistance in writing labels; and to Carolyn Hitchcock for assistance in taking down the exhibit. Additional thanks to Cindy Hartwell for design and production of the online exhibit. Thanks to Susan Fisher, Ronda Ballard, Nancy Reid, and Jan Bell for their assistance in the early stages of developing the exhibit. Thanks to Matthew Johnson, Manabu Saito, and Holly Swangstu for their time and expertise in judging the entries in the juried portion of the exhibit. Thanks to many artists and collectors for the loan of their artworks, particularly, Richard and Patricia Wiedhopf, Richard Felger, Wendy Hodgson, Matthew Johnson, Manabu Saito, Dixie Z. Damrel, Linda Brewer, Gene Josephs and Jane Evans, and Carrie and Bob Evans. 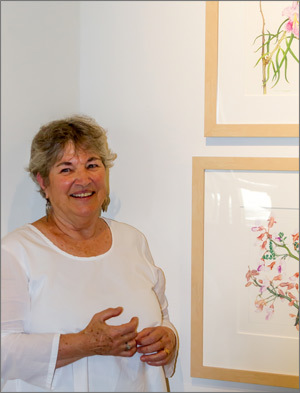 Thanks to Michelle McMahon and Laura Crumbacher of the University of Arizona Herbarium, Beth Brand of the Desert Botanical Garden, and Margaret Barton of the Arizona Natural History Museum for arranging the loan of artwork from their institutions. Thanks to Ray Goodwin, Michael Davalt, and Joie Giunta for photographing the exhibit and to Jeff Smith of FotoSmith for photographing the artwork from the Desert Botanical Garden. Apprecation also goes to the Arizona Native Plant Society for permission to reproduce their poster Sonoran Desert Wildflowers for the online exhibit. Finally, thanks to the staff and volunteers of our exhibit co-sponsor, the Arizona-Sonora Desert Museum Art Institute: Holly Swangstu, Director; Moira Dooley, Exhibitions Specialist; Deanna Roach, Enrollment Coordinator; volunteers Kathy Goepfert and Ray Goodwin; and intern Torrey Zismann.